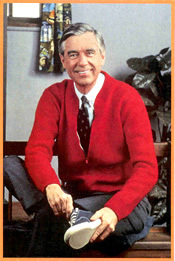 Now that Mister Rogers has closeted his cardigan and slipped off his sneakers for his last episode, the secret is out. The TV face who graced family rooms across America for 34 years is not just a gifted broadcaster; he's an ordained minister. With the beginning of each TV visit, Mister Rogers came through the front door and proceeded to remove his sport coat and street shoes to don a sweater and sneakers. He looked so comfortable dressed down, I decided to follow suit. When I change my clothes, my priorities shift from my briefcase to my children. When I arrive home after a long day at work, what better way to change my orientation than to change my clothes? Hanging up the tweed blazer and pulling on a polo shirt reminds me where I am. My priorities shift from my briefcase to my children proudly displaying their creations from school. And when my youngest announces after dinner, "Dad, it's time to play Grip Ball," I'm ready. An inside voice goes a long way. Mister Rogers never raised his voice. He had a soothing, almost whisper-like tone, which allowed him to address many tough topics children faced, like the death of pets. Yes, his signature inflections were fodder for late-night TV comedians, but what the man in the cardigan sweaters modeled for me was anything but funny. I grew up in a Mediterranean family where emotional outbursts were as predictable as the nightly news. As a result, when I became a parent, my tendency was to get loud when I got angry. After all, my experience had taught me that family love is not disproved by loud conversations. 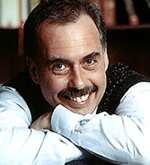 I quickly learned that there was something much more attractive to Mister Rogers' easy-spoken ways. When I shouted at my kids, they generally yelled back or got defensive. When I succeeded at being calm, things went smoother. Come to think of it, whenever I've been stopped by a police officer for a traffic violation, he has spoken to me in a calm, controlled manner. I don't remember him jumping up and down and hollering. Music is the key to harmony. To the seminary-trained broadcaster, music provided a creative means for teaching life lessons. Every episode of "Mister Rogers' Neighborhood" began with "Won't You Be My Neighbor?" and concluded with "It's Such a Good Feeling [to Know You're Alive]," both written by the host. To the seminary-trained broadcaster, music provided a creative means for teaching life lessons. Early on in our family we adopted Mister Rogers' ways. Instead of saying a rote prayer at meal times, we sang a song of grace. My wife and I rocked our babies to sleep singing an old Swedish hymn. Psalty or The Donut Man tapes accompanied our drives to Nana's house or to school. In Fred Rogers' fashion, we even wrote little ditties to teach our kids how to spell our last name as well as how to remember their phone number and address. When you make believe, you achieve more than just play. When the trolley bell sounded, we knew quite well what was coming next. Mister Rogers would change hats and become the behind-the-scenes voices to King Friday, Lady Elaine Fairchilde, Daniel Striped Tiger and others. It amazed me how such simple puppets could be used so effectively to impart moral insights. Pretending had value for me as well. When my daughters requested my presence on the family room floor to play dolls, I complied. Seizing the moment to incorporate values about friendship, forgiveness and faith, I was able to pass on what I believed to my girls by putting words in the mouths of those plastic dolls. "Just As I Am" isn't just a gospel song. If you watched Mister Rogers with regularity, you know the phrase he would use to instill self-worth in his viewers: "I like you just the way you are!" His Grandpa McFeeley used to say those words to him when Mister Rogers was a child. "I like you just the way you are!" Because that little blessing is quite biblical, I started celebrating my kids' unique strengths and verbally affirming them. When they compared themselves with peers who were more popular or pretty, I'd remind them they were special because God had made them unique. When my girls disobeyed or disappointed me and I had to express disapproval, it was always against the backdrop of acceptance and love. Everybody has a job we depend on. Mister Rogers enjoyed taking his viewers on visits to offices and factories, hospitals and zoos. He wanted to introduce kids to people who work in all places, because everybody benefits from the jobs others do. As a Presbyterian minister, Mister Rogers believes every occupation is a calling. The color of a person's collar doesn't matter, but his work sure does. That truth is a timely one as my eldest contemplates a career after college. But application of this truth existed long before choosing a college major. In our home, we all have our different jobs to do. Taking out the trash. Feeding the dogs. Setting the table. Driving to school. All are important, because in order for our home to run smoothly we rely on everyone to do his or her chores. Mister Rogers' programs continue in reruns, and he's working on other family-related projects. I'm glad about that. When I need to be coached from time to time on how to be a better dad, I can still listen for the trolley bell and a familiar voice. Taken from Focus on the Family magazine, Dec. 2002. Article copyright © 2002, Greg Asimakoupoulos. February 27, 2003, after a battle with stomach cancer. He was 74. When your public words match personal deeds, you can help your children learn to stand up for truth.